It's one of my very favorite documentaries. It's a comfort film for me. I'm a total sucker for any kind of behind-the-scenes material whatsoever. I draw inspiration from it. Any kind of creative process is something I want to observe, whether it's something for performance or fine art or whatever. It takes the mystery and the loftiness away from my own goals. All art is just the end result of a practical process. We don't have television either, like most people I watch my television on the internet nowadays. I don't miss t.v., not even a little. I don't miss the syndicated re-runs, the ridiculous tabloid-like newscasts, the ninety dollar bill, or all the obnoxious commercials. So movies are my background noise, movies are my television. 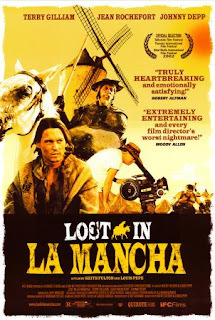 Lost In La Mancha is one of those movies that I've seen so many times that I couldn't possibly keep count. Which is funny, because it's a very bittersweet film about Terry Gilliams' failed attempt at shooting a Don Quixote movie. It's not an entirely pleasant viewing experience. It is therpaeutic to know that even the big-wigs fail though, and fail big. And on a completely meaningless and superficial note regarding the film; I would love to wear my hair the way Johnny Depp has his in this film. In fact, I'd like to dress more like Johnny Depp every day of my life. No pirate costumes, just striped t-shirts and ripped jeans and random jewelry and wild hair. This is one of the luxuries that actors are afforded, the ability to maintain absolutely whatever personal style they wish in their every day lives. See? See how much just comes flowing out all because of Lost In La Mancha? I could go on forever about the strange sidebars that just watching this movie brings up, documentaries are very good for you. Don't ever let anyone tell you any different. Oh wait...that's not right. I mean, "Viva Las Vegas". Drat, that's not it either, is it? "Yes, we can." There it is. Is anybody else REALLY excited about the new hologram/Princess Leia thingie that debuted on CNN last night? AMAZING! I try to stay off of political subject matter on this blog, but I have to say that I'm really really proud of people for getting out and doing something. This election was CLEAR. There is nothing for people to argue about after this one, the people have spoken! And my, isn't that a nice feeling? I really hope people can keep these sentiments and stay responsible for their own communities with this kind of fervor. Now, I feel like watching, "My Fellow Americans", because once again I can breathe a sigh of relief that we no longer have such an Emporer Palpatine for our leader. He'll be going soon, and no matter who you voted for, you have to be glad of that. Considering burning someone in effigy? If I were a drag queen, she would be the FIRST woman I would try to build an act around. Sadly, I am not a drag queen. (Yet.) I learned about Carmen from my Mom, who was also not a drag queen but who did run a singing telegram business and did a Carmen-impersonation complete with a hat covered in fruit which simultanously had the ability to mortify/amaze me. The character was called "Carmen Banana" and was a hit every year at the Weston Hotel Easter Brunch. I never stopped to wonder, until now, why exactly they hired my mother to dress as a latin diva from the past to celebrate the resurrection of Jesus. But hey, to each his own. And I always got free breakfast. Well, I had all but given up on Halloween this year...when Jake and I got the bright idea to stop working for an entire evening and go socialize with FRIENDS. I know, seems like a no-brainer. But the past couple of months have been work, work, work. It's been great that means we're getting jobs and finishing projects, but I'm starting to feel like the oldest 26 year old that ever lived. SO, starting with Thursday nights War of the Worlds broadcast, in which I was an extra voice and helped with costumes, I started to unwind. Being onstage is always fun for me, even in a supporting role. And I got to dress my favorite way...old-timey. Broadcast went awesome, and I couldn't help but wish that something would go awry and the whole cast would get transported back to 1939 in some cool sci-fi way and have a mad-cap adventure. It was really nice to meet new people, and there's always something magic about the camaraderie of a cast, even one you've only spent a few days with. There was one weird thing, a couple of times I felt like I was going to pass out onstage...hmm, more on that later. Halloween day it was work all day on a piece for Indiana Business Magazine, and rounding up the last of the costumes to take back to one of the theaters we borrowed from. Jake and I started home around 5-ish, got home and realized we had completely failed to plan anything for ourselves on Halloween, as usual. That's three years running without a costume. SHAME on me. "Shame, shame, know your name." Who said that in Goonies? I'll owe anyone a cookie who knows that quote. So we actually picked up the phone and called friends! Which we almost never do, we're accidental hermits. Either working all the time or having no money to go out and do ANYTHING with people that involves cash. Like the movies or dinner. But we found out the old gang was watching a scary movie and we hopped on the bandwagon and I'm so glad we did. In fact, I was so happy to see everyone and get out of the house and away from work that I went a little nuts. I've barely eaten this past week, I just kept forgetting, or I simply didn't have time...hence the passing out I thought I would do onstage. Then I got to our friend's house and had a ton of candy, scared the bejeesus out of myself with a movie, nursed a half a bloody mary for three hours, and then blacked out. I remember getting up because I felt hotter than I ever have, and I couldn't hear anything. I also thought for sure (gross alert) that I was going to vomit. So I made my way to the kitchen, and I braced myself on the counter, and honestly had the thought, "I just need to lie down for a minute and I'll be okay." After that I remember laying on the floor feeling some nice cool air, and hearing someone say something about an ambulence...I "came to" (as they say in old movies). My first thought? I don't want to pay any more hospital bills! haha! So I rolled around for a minute feeling nauseous, sort of like I was half in a dream, and then just sort of snapped out of it. Just like that. I was a little shaky and a little um, how do I put this? Floaty. I felt floaty. Then I went home, where Jake made me eat toast and kept looking at me with furrowed brows and worried eyes. I feel terrible, I can't imagine how I'd feel if I walked into a kitchen somewhere and he was on the floor. Scary. I rounded out the Halloween season with a night chock full o' german expressionist zombie nightmares. And something about wolves killing people in a Wal-Mart and a marathon through the statue of liberty. So I pronounce a Halloween WIN for myself this year. There were no costumes, but there were scares. And I wasn't working, and I wasn't moping about not doing anything fun. And I got to eat candy. Next year, I want THE Halloween blow out, in my Troi costume, dancing to music, with a tacky fog machine somewhere. Don't even particularly know why. Maybe because it's 2:17 a.m. and I should be asleep, and I'm always more self-confident when everyone else is sleeping. So, I was at rehearsal for War of the Worlds. Which is going to be awesome and which you can listen to tomorrow night at 8pm on WCRD.net. BUT, every single time someone said, "Mars" this was literally all I could think of...which takes me right back to being hopelessly immature and laughing myself sick in high school CONSTANTLY anytime I was meant to be paying attention in class/practice/rehearsals. My personal favorite action heroine of all time. 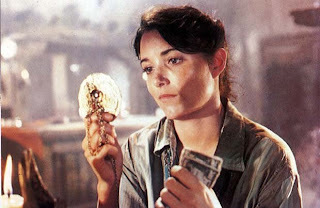 I will miss my chance to see her on the big screen tonight in Indianapolis, and I have NEVER seen Raiders on the big screen. It's something I simply must do at some point in my life. Alas, I have rehearsal for a War or the Worlds broadcast being re-created tomorrow on IPR and can't miss it. Until next time, Marion. It's probably best that I wait until I can dress like you anyway...can't go to something like Raiders WITHOUT a costume! What kind of a geek would I be? More fun, less "me, me, me, blah, blah, blah"
To quote the great Dan Aykroyd, "Wanna see something really scary?" is hard. Even a five minute, hi-def short. It's fun and amazing and wonderful and worth it. For sure. But the first time you really dig in there and commit to your first project, you will learn a lot. More than you ever realized you'd have to learn on topics that you never knew would matter so much. You will learn about group dynamics, and how one single person on a set can bring an entire day down in tone. Can actually affect takes with their bad attitude. You will learn about how every other person in the room would do things, if they were you. And you have to remind them, that they are not you, and they will get their chance if they want it in the future. You will learn very quickly who to trust, who is willing to put the work in, who cares about the end result, and who is simply there to get their name in the credits. You will be astonished at how much like your youth it can be, and how gossip can ruin working relationships on-set...just like in high school, and how much like teenage girls grown men can behave when they want to. You will learn who you think is amazing, who is really going places with their career, and who you will never want to work with again. You will learn that some people HATE it that you are trying something new, something big, something for yourself and your future. Some people want you to fail, just so they can say, "I told you so." You will learn that people hate schedules, and will do anything they can to get out of them, even if they've already committed months ago. You will learn that the next time you do things, you will only hire people by contract. You will stay up all hours running insane errands, sometimes involving print-screening, primer, green soda, and/or lab coats. You will learn that if you even mention to some people that you are working on a movie, they will immediately think you are some kind of big-wig, even when you try to convince them that you are doing this thing by the skin of your teeth, that it's only a short, and that you have nothing to do with money or power. You will learn to love the work for the sake of the work and the end result, and not care in the least if nobody knows what your job is, or treats you like you don't belong on set. Even when you wrote the thing, produced it all, and painted the freaking set while everyone else was sleeping. You will learn how to kick people off of a set. By the end, you will love it or hate it. Or some combination of both. But you will immediately know if you will be doing it again. That was my thinly veiled letter to myself about why I am not as cool as all the women I am currently assembling a book about. 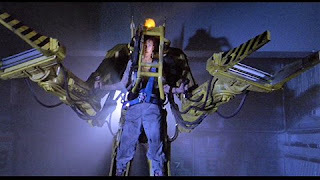 For example, I am not as cool as Ripley from "Aliens", for a plethora of reasons that you can read about when my puny book is finished. ...is an amazing writer of non-fiction essays. For all the days that I think to myself, "Who on Earth would ever want to read an entire book about women in action films?" or, "Look at the state that the world is in, why couldn't I have just wanted to be a doctor or a scientist? ", Nora Ephron makes me feel like writers still matter. She writes about things like borscht, purses, makeup, national scandals, marriage, divorce, parties, and cabbage strudel. She writes about everything, from the boring the the fascinating, but what she has to say about her topics is NEVER boring. And she's not safe either. She really says what she thinks and feels, and she's quite the voice of reason and accountability. And I want to be just like her when I grow up. I want a career like hers, one that starts with essays and perhaps some journalism, and ends in books and movies. Except I also want my own movie studio, theater, bookstore, and film festival. (I mean, not named after me...just one to run. Psht, I don't want to push it. )That's not too much to ask, is it? Don't answer that. I know the world’s going down in flames and all, but I’d like to draw attention to yet another crisis. The crisis of speech. Yes, I know this is very Henry Higgins of me, but I have to ask, why can’t the young people of America learn how to speak? I was at the library last night, and genuinely wanted to go berserker rage on the place. I wanted to start overturning desks and screaming, “Why are you ALL talking like PARIS HILTON?” And in a less rage inducing addendum, "Why are you all talking so loud?" Everyone, girls, guys, roughly under the age of 27-ish, is talking in this strange neo-valley girl accent. Their words slope up in tone at the end of their speech, they say, “Oh my God.” before and after every sentence. They do this weird fake baby talk, fake sore-throat, inflection that drives me insane. They say, “No way” And, “Totally”. And it’s impossible to talk about intelligent things in this voice. It has to be an act. It has to be put-on. Please God, somebody tell me this isn’t really the way people are talking. It’s like they all watched Clueless and DIDN’T get that it was a SPOOF. Where does this accent come from? I don’t have MTV, so tell me, is it from shows on that channel? Is it Gossip Girl? Is it, in fact, Paris Hilton? Because I have heard her talk, and it does resemble the way she sounds. Is it from a certain part of the country that has become a trend? WHAT? What is it? It makes me want to say things like, “Blast”, and, “Infernal”, and, “Kids today”! Is it cool? Is it cool to sound like an idiot? Because that’s how they sound to me. Stupid. And I’m normally the kind of person who thinks that you shouldn’t share negative emotions on the internet, and you shouldn't even use words like idiot and stupid. That if you have something to say, you should say it definitively and respectfully. But this whole accent thing is driving me mad. Does anyone have answers or insights? Why? Why? Why? Why? Why? Why are they talking like her??? Were you? Good old Grandma Jenkins...bringing the sassy whenever needed. I think I'd like to see either a coffee table book or a calender filled with pictures of stock traders, wearing their blue coats, feeling emotions other than extreme happiness or utter despair. With the economy being so unpredicatable, I'm tired of just seeing those two "looks". They're always on the cover of every news site ever with their heads in their hands, or smiling from ear to ear. Don't they know that it's just going to plummet/soar the next day? So somebody get on those pictures, let's see a trader looking confused, or maybe sentimental. Give me some range, traders! Shared my thoughts with surprising clarity on that matter here. Special note: There are no good images that pop up on google when you enter the words "scary cafeteria". Something must be done. So Jake walks in this morning at elevenish, with what looks to be an armful of DVD sets. This is not unusual for us, as on top of all the other geeky interests, we are also library nerds. So it's not an unusual sight for either one of us to come home and catch the other one with 6 discs of Star Trek, or three biographies, or whatever. But these looked different. As it turns out, there is a new faculty member at Ball State who is a member of the academy. He directed the pilot of Magnum P.I., is friends with Ben Kingsley, and has a house in Rome. A house in Rome. This guy is the real deal. Anyway, there's just something really cool about seeing these special DVD's. Just a real novelty for me. Of course, I had to ask, "Does he have the for your consideration DVD of, "For Your Consideration"? I know, har har. I read my blog from yesterday, and my conclusion is that I was too tired to write yesterday. I read that entry, and it sounds like I should've been smoking a pipe and saying, "I say, old chap." I think I was accidentally trying to sound impressive in order to calm myself down. A way of going, "See? It's okay that you're totally frazzled, look how sage-like you are." Then again, I'm my own worst critic. What I should have said was, "I haven't been this tired since I was working doubles as a waitress at a certain Italian themed chain restaurant. I haven't been this stressed out since...ever. 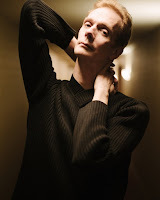 And I haven't been this excited about anything since I interviewed Doug Jones." I'm getting all pent up with stress, remember that old Berenstain Bears books, "Too Much Birthday"? Yeah, it's kind of like that. My ambition and my planning sometimes really start to override the simple joys that life has to offer. Cooking a meal, taking a walk (Oh, how I love walks! ), sitting down to write just because I want to, reading a book of essays, and so on and so forth. How will I ever pull my own focus, I wonder? Or to put it in a very Truman Show way, "How's it going to end?" though that sounds way more fatalistic than I am feeling. I can see Jake and I doing so many things with our lives...I kind of just want to get there already. I'm impatient, I know. But I feel like today is the day I belong on a full movie set. Today is the day to publish my first book. But in actuality, all that vision is a distraction. Because so far, today has been the day to sleep in until 11:00, drink a glass of water, and waste my time surfing the internet and whining about a lack of focus. I had just started really delving into one of the chapters of my book (the one due in December, self-imposed deadline...) when my phone rang. It was Jake (my husband, for those of you who don't know) and he needed some help. It was the first day of shooting on his first hi-def short film. He's done many a short before, and together he and I have written a handful of full feature scripts that we promptly registered with the WGA. So I pick up the phone, and as it turns out, I'm needed on set to do a little makeup. So I grabbed my powder and a few other things, and walked to the studio where they're filming. I basically didn't leave the set for the next four days. Jake and I wrote the short together, and it's a fictional "dramady" (I hate that word, but it fits.) about the commercialization of the space program centered around the astronaut who gets to be the "third to Mars". I know it sounds a little strange, and its definitely unique. It's a full script, but we found a chunk of it to turn into a short. Jake was able to wrangle a camera called the F-900 that used to belong to George Lucas. It was used on the set of Episode I, so here's hoping it's not cursed to bring only dull entertainment into the world. I pre-produced the HECK out of this sucker. Writes, re-writes, casting, making the shooting schedule, making sure Jake had what he needed to get started, asking dreaded questions every day like, "Did you find a green screen compositor yet?" or, "Who's going to run lights?" Nagging does have a very useful place in the film business. Since I've been on set, it's been more re-writes, powdering people's faces and foreheads, line producing, spray painting styrofoam, wrangling props in general, fixing things at the last miute, making phone calls, reading lines out loud, directing actors, getting coffee, on and on and on. Today I haven't been able to keep my eyes open. But the to-do list still looms so large in my brain. Every time I shut my eyes its, "Gotta get that still photo for the ship interior, gotta order more prop shirts in time to have them printed, gotta get carpenter's tools to the set," etc. There's so much to do, and it's only about a 5 minute short, but we're really throwing everything we have into it. Jake was lucky enough to snag an amazing D.P., camera op, and lighting crew...so even if the plot stinks, at least I know it will look good. I've always had a dream to be in film. For a long time I wanted desperately to be a comedienne or a character actress. And I've always wanted to own my own small old-timey theater where I could screen old movies, 80's childhood flicks, and have plays and film festivals. I've wanted to direct, and I once had a theater teacher who tried her all to get me to direct a short film for the Cinema Entertainment Consortium, but I left school before I had the chance. If there's any place where I can truly see a future for myself, its in independant film. I've been reading about Mary Pickford, and just the film scene in its infancy, and I think there's a good chance that film is really going to get back to its roots. Economic downturn can usually support film, and the studio system as is has really started heading downhill. I think studios will always be there, but with the incredible equipment that exists today, and the accesibility of film, I think that there are going to be more and more people just making their own movies instead of trying to go out to California or New York, get an agent, and "make it" there. We've always said that we wanted to do independant film in order to maintain control over our ideas. Call me old-fashioned, but I don't want to hand over every script I ever write so that it can sit in a drawer some where collecting dust. I write these things because I fall in LOVE with a story. Don't get me wrong, if an agent knocked on my door tomorrow and offered to broker a deal for one of my scripts with a studio, I'd JUMP on it. Paying rent comes first at this stage in my life. And I'm not too proud to sell my work...that would be amazing. But there's something really exciting about this project we're doing. It's the first time we've really put it all on the line like this. Normally, we film something in a weekend and just tell people that it's going to be an asset we use to get a script sold someday. This time, we're actually trying to make something great. Well, I've done this year's 2008 Halloween movie recommendations. Here they are! It was a HUGE challenge this year, because I picked so many of my favorites last year. But I focused on diversifying the list, and as usual, it's very "something for everyone". Wrote this, and posted it on AC, but I'm starting to wonder if that's just the site where my bland writing goes to die. I get so distracted and obsessed with writing for the websites that I write for, that the days go by and I don't put as much effort into writing and working on my books. It's an easy distraction that gives me the feeling that I'm doing something. Writing a book is terrifying, and makes you feel like a complete and total fraud, it's HARD, and it doesn't "feel" as good as writing for the web. I wonder if David Sedaris still feels like he's getting away with murder every time he publishes a book, or if that feeling eventually melts away. One of the real problems that I'm facing is the fact that SO many of us writers are talking about the SAME memories. Pop culture encrusted, media-filled childhoods. And that's GREAT. I love writing about those things, but I can't keep up. For every column I write about She-Ra, it's been done before. Probably a thousand times. But then, hasn't everything been written about before, isn't it all about the voice? And there's that thought again, it creeps in, "Maybe you should stop worrying about freelance for a minute and focus on your book/books." To which my inside voice replies, "Are you insane? If I stop working on my freelance for even a minute, I'll start losing income! I barely make it as is." And you know what they say about being crazy, you're only crazy when you answer yourself...well then, please bleach and starch my straight jacket. I'm almost ready for it. Mama's, don't let your babies grow up to be freelance writers. I feel like this when I think about the economy and the election. "Spread the picture on a wider screen!" Waiting for hand-delivery of coffee from gracious husband, must write offline today, must stop doling out best ideas and words to editors who are too busy to review them(not their fault)...must keep some for book, must talk like Frankenstein, "FIre BAD!". Anyway, is there ANYTHING cooler than SDJ scatting? Don't answer that...and I wish the song wasn't about hippies, but you take what you can get, right? I woke up with this in my head after dreaming of messing up a rich person's house out of spite. I rubbed toothpaste on their bathroom counters, taught their children how to play dress up, and then yelled at them for being such sticks in the mud. My brain at night = ??????? A friend of mine posted an amazing blog this morning about how cruel we can be as people. And it's so true. I think that I'm in the right mindset to explore this, because it's Rosh Hashana, which is meant to be ten whole days of looking at your life as honestly as possible and admitting where you're wrong. Apologizing. Letting yourself feel bad about where you've gone wrong in your life. It's so much healthier than just holding it in and becoming bitter and starting to judge everyone else. I have this really strong urge to HELP young geeky girls who just need to be loved. So I write these pieces about dating and relationships. But I often conveniently leave out the mistakes I made in relationships. Or I find this crafty way of talking about it like a pagent contestant, taking false responsibility like, "I should've realized it wasn't the relationship for me." instead of, "I held on for dear life and tried to guilt someone into staying with me." or, "I cut and ran from a relationship without ever explaining to someone why, and consequently broke their heart." And here I am, happily married, with a husband who listens to these things over and over again...but those scars are still there. And I know its important not to dwell. You shouldn't wallow in guilt. Ever. And I don't want to get, "stuck in a moment" (Thank you, Bono.) That doesn't help anybody. But it is important to take responsibility, especially during this time of year...'tis the season. Hey, it's not as much fun as the season to be jolly...the season to be repentant sounds a lot worse. And as rotten as it feels, I think ultimately, as Martha would say, "It's a good thing." I need more freelance work...right now I have enough time on my hands to go absolutely scavenging through Youtube for my favorite childhood Halloween videos, and this probably isn't even the half of it. "My Precious Audrey!! !I can't tell you how much I loved your interview with me over on AintItCoolnews. com. I will stand by this statement: You, young lady, have a true gift for finding a personal story about someone that is very difficult to dig out of people. Thank you for taking the time to find mine. Your energy, enthusiasm, prior knowledge, and creative line of questioning kept me alert and energized to share myself, quirks, funny voices, facial expressions, armpit farts, and all.And please remember, the comments section on those articles are usually full of 13 year olds trying to be funny. Bless their hearts, at least we got them reading. And from what all those campaigns on public TV tell us, that's a good thing. They'll get nicer with age .... we all had to.There's Love!!! --- Dougie J.OOH -- But I do want to thank all of the nice people who left such glowing comments, which far out-numbered those precious 13 year olds with their temporarily misguided humor. (This will all make sense when you read the message below) ... LOVE!!!" Admittedly, I'm a little ashamed of myself for even caring about what someone on a message board would say, I'm normally very, "I'm rubber, you're glue". I felt the need to stand up for Doug in this case, and now that I know Doug is cool with it, I'm all settled down. I'm going back to being Perky-Bot 5000 now, and I'm going to "put this in my back pocket" for when I need it most! I'm always saying that I'm going to write a book about the special issues that came out of my dating years as a geek. I feel like I had this painful but valuable experience, and I can see girls around the age of 18 or 19, and I feel like I have to warn them that they're about to fall down a manhole or something...especially if they're lady geeks! The truth is, I have enough to say about what not to do regarding relationships that I could probably fill volumes. Especially when it comes to the way geek women are often put on pedestals, or admired from afar. But I'd rather focus on the other topics I'm working on, look forward, and throw out little bits of wisdom on the subject here and there. So I've used EHow.com to write a handful of articles about Geek socialization and dating. I get it though, I've read and re-read the interview. I'm a VERY happy person. I talk about things that I guess are traditionally "gay", I LOVE me some Judy, musical theater, Disney (Is that gay now?) and lots of other stereotypically, but not exclusively "gay" things. When I interview, I often put on a character facade...almost like an SNL character or something. I joke about it being similar to "The Chris Farley" show, because I most definitely lose my cool around people that I admire, but honestly, a lot of it is purposeful and controlled. I admit to "geeking out", and I ALWAYS have the time of my life. I want them to feel comfortable, and often times these people have been asked THE SAME questions a hundred billion times, so I like to surprise and entertain them. I like them to feel liked, and I like to take the opportunity to just chat with them. When you grow up with a Mom who does singing telegrams for a living, you learn very quickly how to work a public character or persona into your life to entertain others, and sometimes its less like I'm interviewing and more like I'm telegram-ming? I have "Audrey II", who comes out just when I need her, and is a mega extrovert, and who DOESN'T hold anything back, who is probably 50% Mary Catherine Gallagher, who should probably be on a stage and not in real life, who kicks and skips and sings and tugs on her pigtails. Seriously, "Sybil" ain't got nothin' on "Audrey II". So she wandered out on the same day that I met Doug Jones, and I let her come out and play the day I got to interview him as well...she makes everyone laugh. I make everyone laugh, when I play that ridiculous 10 year old version of myself who is bubbling over with excitement...and it works for me when I need it to most. As psychotic as that sounds. It's the actor inside of me, I try to keep my hand in by doing a couple of acting jobs a year, and it's ALWAYS fun and I ALWAYS wonder to myself why I don't just have my hand in permanently...but there's no improv around here to play with, so that answers that question. ANYWAY, I've been called, "truly pathetic" over that interview. I've been lambasted as someone who made women the world-over look like idiots. (My, but that's an awful lot to glean off of one interview, I insulted the whole of womanhood, because I like Parker Posey?) I've been told all kinds of terrible things about myself by people who I've never met, and I've also been sent some of the kindest, sweetest, most loving comments and emails I've EVER recieved and been told to really GO for it with my career on every front! It was quite a lot of responses to deal with. And I have to say, it really made me sympathize with Doug...here's this amazing actor doing all of these incredibly physical roles and being notoriously nice to his fans, and all people can think to come up with is, "He sounds gay"? Really? I take some responsibility for that, because the interview was originally on video. So several times when he was saying things like, "Honey Child" or whatever else, he was PLAYING a character or making a joke. He doesn't just talk like that normally walking down the street. He's a comedian and an actor, and we were playing off of each other, doing different voices and what-not, and I didn't clarify that. But so what if he did talk like that in real life? I'm getting sick of the only thing people are coming up with is that things or people are "gay". REALLY? How old are you? And also, you are saying that like it's a negative thing if it were true? Do you mean that you think someone is acting flamboyant? Do you mean that you thought they were theatrical, stereotypical, annoying, fun? What do you mean? Give me another word! That's just the most high school thing I ever heard, to label a performer "gay" for performing...but that's probably a tactic as old as performing itself. I talked to my Mom the day after the interview, and we started making these jokes that I was the new gay "pied piper", the fruit fly to end all fruit flies! "I'm SOOOOO gay, look at meeeee, in all my gayness!!!!!!!!!" Well, if its "gay" to live your dream, to have a BALL with people you admire, to do what you love for a living, to lose it a little bit and geek out, well then, get in line! Follow me, I will lead you all to happy gaydom!